This week the Year 3's have demonstrated great resilience as we started our Topic. "How architecture influenced society across the ages". 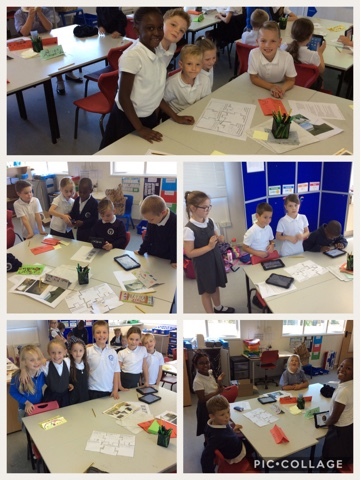 They have immersed themselves in this new topic and used their detective skills whilst carrying out fun tasks to research different buildings from the past, starting in particular with the Stone Age. The topic kick started with some deep thinking regarding what they wanted to find out. After investigating different structures from the past they were given the opportunity to create their own buildings using junk modelling and natural resources. The children demonstrated reciprocity when working in table teams to solve a puzzle containing probing questions relating to structures from the past. They were encouraged to ponder about "Why did stone age buildings change?" and the kinds of of Historical sources available. among other things. Tilly said "There's a secondary source in the book corner its a book about the Stone Age". The children were given the task of replicating a type of house using classroom equipment and whatever they could grab from outside! And Tyler, Moyin, Nancy, and Bella made a minka from paper and miltilink. This was a challenging task that demanded lots of reciprocity and patience from all groups. Good job year 3! Great teamwork! Have a good weekend and we look forward to seeing those reading records! Dads and Kids Sports' Night! Week 1 In Year 4!